Faceing FRP Lock issue in your device? 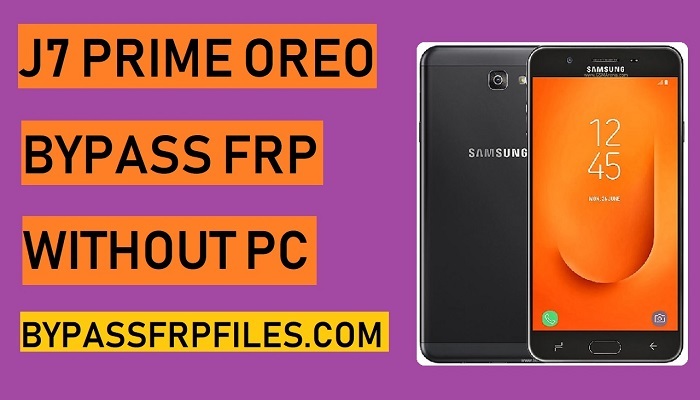 too many users faceing the FRP issues so here we share with you a method to Bypass Google FRP Samsung Galaxy J7 Prime (Android-8.1) Without PC. before you start to follow this process you needed some files a wifi connections and FRP Files, we all know Samsung has added new security features on there Galaxy series (Android-8.1) devices. to Bypass Google FRP Samsung Galaxy J7 Prime (Android-8.1) Without PC you have to follow this process fully. Note:- This method we tried for Samsung SM-G610F FRP, you can try also some other J7 Prime Models like Bypass SM-G610Y FRP, SM-G6100 FRP. FRP is (Factory Reset Protection) for our Latest Android devices, if you forget the Pattern, Password and fingerprint lock for this you have to hard reset your device by using keys, after you hard reset your device then you need to enter the previously synced Gmail ID to using your access your device home screen once again, then why we need to Bypass? its very simple answer if we forget the Gmail ID that we enter synced previously on our device, then you need to Bypass FRP Samsung J7 Prime and use our device once again, now follow the below process very carefully to Bypass FRP Google Account Samsung J7 Prime easily. -First, Connect your device to any valid Wifi connection. -Then back to the first welocme screen once again. -Now enable the Talback option to Bypass Google FRP Samsung Galaxy J7 Prime (Android-8.1) (G610F FRP). -Press the “Home” button 3-7 times then you have to wait 10sec to bring talkback tutorial screen. -Draw “L” on your talkback tutorial screen to bring “Global Context Menu”. -Then double tap on the “Talkback Settings” from that popup. -Now you will redirected to “Talkback Settings” screen. -Now press the “Home” key multiple times to suspend the talkback options. -Then go down and then select the “Help & feedback” option from there. -After that, tap on the “get started with voice access” from there. -Then you will get a “Youtube Video” from that screen. -Then Pause the video, and then you will get Video titile and “clock” icon and share icon. Ok just tap on the “Clock” icon from there. -Now you will redirect to the “Samsung Browser”. -But at first, we need to download only one application that helps you to Bypass FRP Samsung J7 Prime without PC easily. Congrats, Now you have only few steps away to Bypass FRP Samsung J7 Prime SM-G610Y FRP Without PC, SM-610F FRP Without PC, SM-G6100 FRP Without PC easily. -Just click on the “Done” button to Bypass Google FRP Samsung J7 Prime Without PC easily. -Now you have successfully Bypass FRP Samsung J7 Prime (Android-8.1.0) without PC (G6100 FRP) easily. Thanks for visiting us, if you facing any problem with this Bypass Google FRP Samsung Galaxy J7 Prime | Bypass FRP Samsung J7 prime (Android-8.1.0) Without PC, SM-G610F FRP Without PC, SM-G610Y FRP Without PC, method then you can comment us on below.